We create opportunity for ALL! Inclusion = confidence for kids: We encourage all Paris School students to pursue and develop their skills and interests–and then we work to help them succeed! From classroom interactions to school clubs and team sports, we understand that the elementary and middle school years are a time of growth and exploration. We know that kids gain confidence from mastering a tough math problem and also discover valuable strengths and skills when they are allowed to fully explore their interests. At Paris School, ALL kids make the team! We are proud of our unique policy of inclusion that encourages kids to try something new. 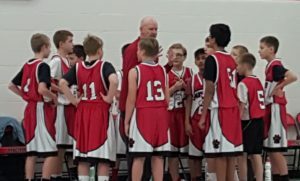 Whether speaking in front of the class, writing and illustrating a book, or representing our school with Panther Pride on the basketball court, we know that kids deserve to participate fully in the activities they choose. Simply: young people become stronger speakers, writers, and athletes when they are encouraged and inspired to speak, write, and play!